• Don’t drink any booze beforehand. If you do – stern look – you won’t get in. • Surprise Surprise: The Maze is not a fashion show so keep your couture in your closet and wear comfy kit and shoes. Like trainers, for instance – trainers are good. • The Crystal Maze involves running and crawling and stuff, so Mumsie says you really do need to have a basic level of fitness and health. • To keep us out of trouble, you have to sign a waiver before you start. It’s got all the usual stuff. Plus, Mumsie insists. • If you’re pregnant – congratulations! 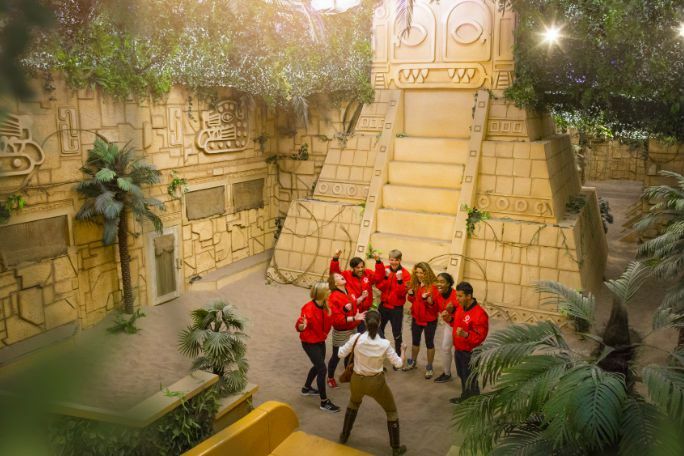 The Crystal Maze LIVE Experience don’t allow anyone at any stage of pregnancy to enter the Maze. Sorry – but congratulations again! • The Crystal Maze LIVE Experience London suitable for children aged 13+ as long as they are at least 1.2 metres tall and are accompanied by a playing and paying adult. If we think you look under 18 we’ll be jealous – and will definitely ask for some ID. • You absolutely, positively, definitely MUST arrive at least 15 minutes before your show time. Latecomers will not be admitted. Please present your printed out voucher at the venue.